I haven't cooked much lately. A new day job and a budding yoga practice have been great for my sanity. But both are sad for my stomach. I'm hungry. 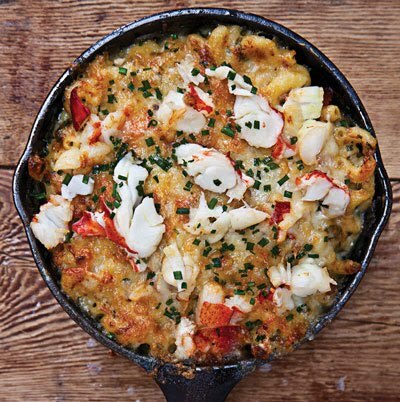 This Lobster Mac 'n Cheese from Saveur magazine is my next dinner project. This dish is served at Macbar, a Manhattan restaurant whose menu lists a dozen mac and cheese variations. 1. Heat oven to 375°. Bring a 4-qt. saucepan of salted water to a boil. Add pasta and cook, stirring occasionally, until cooked halfway through, about 3 minutes. Drain pasta, transfer to a bowl, and set aside. 2. Melt butter in a 4-qt. saucepan over medium heat. Add flour and cook, whisking constantly, until smooth, about 1 minute. Whisk in milk and cook, continuing to whisk often, until sauce has thickened and coats the back of a spoon, about 10 minutes. Remove pan from heat and stir in 2 cups fontina, along with the mascarpone, broth, brandy, Tabasco, and nutmeg; season with salt and pepper. Add reserved pasta to cheese sauce. Stir in half each of the lobster, chives, and scallions. 3. Transfer mixture to a 9" x 13" baking dish and sprinkle with remaining fontina and the cheddar. Bake until golden brown and bubbly, about 30 minutes. Let cool for 10 minutes. Garnish with remaining lobster, scallions, and chives.